An instance store provides temporary block-level storage for your instance. This storage is located on disks that are physically attached to the host computer. Instance store is ideal for temporary storage of information that changes frequently, such as buffers, caches, scratch data, and other temporary content, or for data that is replicated across a fleet of instances, such as a load-balanced pool of web servers. An instance store consists of one or more instance store volumes exposed as block devices. The size of an instance store as well as the number of devices available varies by instance type. The virtual devices for instance store volumes are ephemeral[0-23]. Instance types that support one instance store volume have ephemeral0. 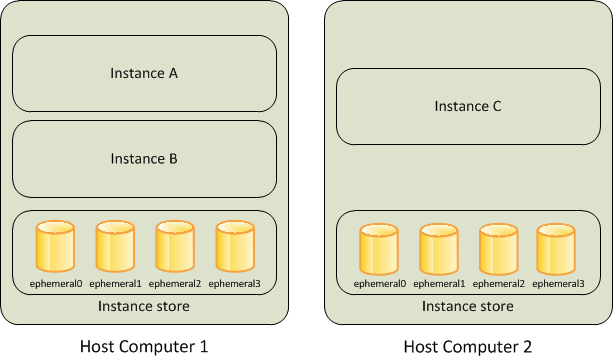 Instance types that support two instance store volumes have ephemeral0 and ephemeral1, and so on. You can specify instance store volumes for an instance only when you launch it. You can't detach an instance store volume from one instance and attach it to a different instance. Therefore, do not rely on instance store for valuable, long-term data. Instead, use more durable data storage, such as Amazon S3, Amazon EBS, or Amazon EFS. When you stop or terminate an instance, every block of storage in the instance store is reset. Therefore, your data cannot be accessed through the instance store of another instance. If you create an AMI from an instance, the data on its instance store volumes isn't preserved and isn't present on the instance store volumes of the instances that you launch from the AMI. The instance type determines the size of the instance store available and the type of hardware used for the instance store volumes. Instance store volumes are included as part of the instance's usage cost. You must specify the instance store volumes that you'd like to use when you launch the instance (except for NVMe instance store volumes, which are available by default). Then format and mount the instance store volumes before using them. You can't make an instance store volume available after you launch the instance. For more information, see Add Instance Store Volumes to Your EC2 Instance. Some instance types use NVMe or SATA-based solid state drives (SSD) to deliver high random I/O performance. This is a good option when you need storage with very low latency, but you don't need the data to persist when the instance terminates or you can take advantage of fault-tolerant architectures. For more information, see SSD Instance Store Volumes. The following table provides the quantity, size, type, and performance optimizations of instance store volumes available on each supported instance type. For a complete list of instance types, including EBS-only types, see Amazon EC2 Instance Types. * Volumes attached to certain instances suffer a first-write penalty unless initialized. For more information, see Optimizing Disk Performance for Instance Store Volumes. ** For more information, see Instance Store Volume TRIM Support. † The c1.medium and m1.small instance types also include a 900 MB instance store swap volume, which may not be automatically enabled at boot time. For more information, see Instance Store Swap Volumes.